In the same complex of buildings as the Mark Twain House, known as Nook Farm, is a house once lived in by the famous advocate for the abolition of slavery, women's rights, and temperance in the use of alcohol. Born in Litchfield CT, Harriet Beecher Stowe (1811-1896) was able to get a traditional academic education—something usually reserved for men at the time—because her older sister Catharine was in charge of the Hartford Female Seminary. She married Calvin Stowe in 1836, and soon adopted his fervent anti-slavery principles. As a mother and teacher living in Brunswick ME, she and her husband were appalled at the torture of slavery in America. After having lost her young son Samuel in 1850, Stowe empathized even more closely with those enslaved whose families were torn asunder. She wrote Uncle Tom's Cabin, her poignant novel about a runaway slave, as a series of installments in an anti-slavery magazine in 1851. It was published in book form in 1852 and became a huge national bestseller, with 300,000 copies sold within a year of publication. Although Harriet Beecher Stowe wrote Uncle Tom's Cabin while living in Brunswick ME, and later lived in Florida, she spent her last years at Nook Farm in Hartford until she died in 1896 at the age of 85. Her last years were marred by dementia which may have been Alzheimer's disease, but she was cared for in her cottage at Nook Farm which retains many of her original furnishings. 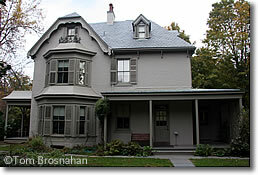 You can visit Harriet Beecher Stowe's cottage along with Mark Twain's grand Victorian mansion at Nook Farm. From the center of Hartford, drive out Asylum Street and Farmington Avenue about 15 blocks. Look for the art deco steeple of Trinity Church, and four blocks later, look for the signs on the left. Harriet Beecher Stowe House, Nook Farm, Hartford CT.